"Owner was great to work with, responded to phone calls right away. Did a great job. Very reliable. Lawn looked great!..." AMS Lawn & Landscapes offers landscape lighting design and installation throughout South Central WI. We provide our clients with attractive lighting options that will beautify, highlight, and secure their homes. Our experienced staff will create a customized plan using fixtures and lamps that suit your needs and lifestyle. Uplights: create a dramatic effect by lighting up fountains, statuary and other landscape features. The lighting surrounding your home and business affects how your property presents itself during the evenings. 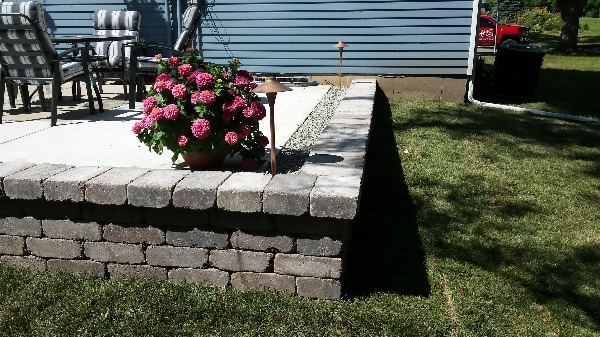 AMS Lawn & Landscapes ensures that your home or business looks its best at all times. We also offer ongoing support and maintenance for all of your outdoor lighting systems. Call 608-228-5282 to schedule your FREE On-Site evaluation today. AMS offers landscape lighting design and installation throughout South Central WI. We provide our clients with attractive lighting options that will beautify, highlight, and secure their homes. Our experienced staff will create a customized plan using fixtures and lamps that suit your needs and lifestyle. The lighting surrounding your home and business affects how your property presents itself during the evenings. AMS ensures that your home or business looks its best at all times. We also offer ongoing support and maintenance for all of your outdoor lighting systems.